The effort includes a website redesign to bolster Give your Kid a Million’s own marketing capabilities, as it embarks on a concerted effort to become an industry-wide insurance marketing leader—one that targets independent agencies throughout North America. The company chose SeoSamba for its vast marketing expertise and advanced technology capabilities, and it has not been disappointed. The new Give your Kid a Million solution “packs an incredible amount of marketing value into one solution for independent property and casualty agencies who wish to increase their life insurance sales,” said Michael Schafer, Give your Kid a Million’s founder. Offering the marketing software as private-label is just the start. Digital marketing is complex, and client retention is paramount to success. Solution providers need cost-effective solutions that both simplify their customers’ lives and help them build a competitive advantage. SeoSamba facilitates digital asset construction and management such as websites and mobile apps, while providing simple reporting to end-users, with comprehensive and advanced marketing management and reporting capabilities to business partners. 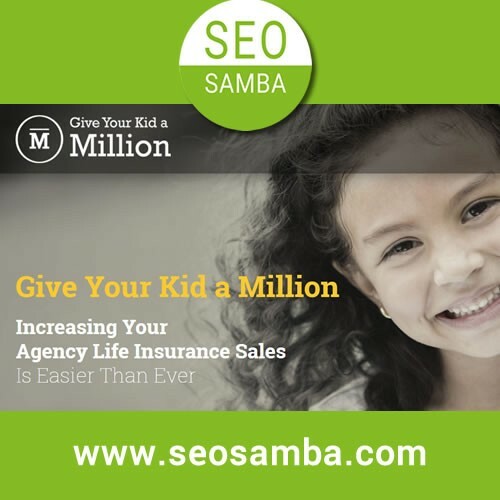 With help from SeoSamba, Give your Kid a Million’s digital marketing services now include a ready-to-use, search-engine-optimized mobile responsive website, search engine marketing, email marketing broadcast, auto-blogging, press release distribution, directory presence, call tracking and a real-time reporting panel at competitive prices, starting at $199 monthly. Give your Kid a Million’s customer support staff will benefit from SeoSamba’s integrated marketing execution and reporting framework that let business solution providers consolidate all digital marketing tools under one interface while being able to deploy services progressively to their clients. “We wanted to offer a marketing framework that was customizable and which our customers will love, and SeoSamba delivers more breadth and depth than any other private-label marketing solution we could find. It delivers exactly what we need without requiring the support of a large service delivery team,” said Schafer. “SeoSamba serves as the marketing hub that allows our clients to charge their customers per valid phone call, web forms, or by e-commerce transactions—and to monitor all transactions on an easy-to-use dashboard,” said Leconte. Give Your Kid a Million helps independent Property and Casualty agencies sell life insurance policies to new and existing prospects, within exclusive territories. Using an automated, subscription-based marketing platform and professionally-developed content, Give Your Kid a Million helps its agency partners focus on their clients and new prospects, and spend less time learning and managing the ever-changing world of digital technology. For more information, visit www.giveyourkidamillion.com. SeoSamba’s patent pending Hub & Spoke technology amplifies marketing effectiveness as companies scale their brand’s footprint. SeoSamba's marketing framework offers more revenue building opportunities and enables more business models than any other solution. SeoSamba hybrid open source marketing framework is built around the SambaSaaS marketing hub and SeoToaster Ultimate CRM +sales automation cloud edition to build and market landing pages, corporate, directories and ecommerce websites. SeoSamba also let you connect, then centrally market and SEO Enterprise WordPress websites with a free or premium plugin.